this giveaway has ended congratulations to our winner, barb hodge! You have until midnight CST on November 30th, 2016 to enter. Click the inside the white rafflecopter box below & enter up to 4 times there. #MODA #AURIFIL #LAUNDRYBASKETQUILTS PRIZE BUNDLE GIVEAWAY! Congratulations to our Winner Joyce K! We're in a flurry of quilty preparation for all our summer shop hops and programs happening here at Rocking Chair Quilts. To celebrate our summer season and all our wonderful customers HERE'S A GIVEAWAY! We are giving away a SWEET prize bundle of Laundry Basket Quilts' Southern Exposure collection to one lucky winner. This Prize Bundle includes a bundle of 30 Southern Exposure Fat Quarters(Yowza!) and - 3 big spools of Aurifil Thread to match (MSR Value $134.99) . You have until midnight CST on June 15th 2016 to enter. Click the rafflecopter box below in this blog post and enter up to 3 times there. WHAT'S THAT? YOU JUST FOUND OUT ABOUT THE SHUFFLE AND YOU NEED PATTERNS ONE THROUGH twenty-four? A CLICK ON the sewing machine logo at the top of this post will TAKE YOU THERE. HERE ARE THE BLOCKS THAT VIOLA SHARED WITH US LAST WEEK- HER FABRICS ARE PERFECT FOR A CHRISTMAS DAY SHUFFLE POST. THANKS VIOLA! We had a very memorable Christmas with our family-so before I talk about my shuffle doings this week, I just want to express how thankful and grateful I am for the wonderful people in my life. Worked on blocks 25, 26 and 27. CHANGE YOUR SEWING MACHINE NEEDLE REGULARLY. A SHARP NEEDLE MAKES EVERYTHING GO SEW WELL. KEEP AN ASSORTMENT OF NEEDLE TYPES AND SIZES ON HAND FOR THE DIFFERENT THINGS YOU SEW. 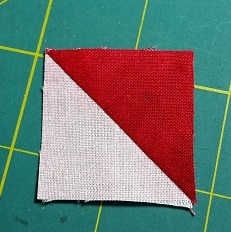 WHEN WORKING ON SMALL PIECING (LIKE OUR SHUFFLE BLOCKS) WHILE A STANDARD DUTY NEEDLE WILL DO , CONSIDER USING A A FINER GAUGE NEEDLE TO HELP YOUR 1/4" SEAM BE EVEN MORE ACCURATE. -consult your sewing machine manual for the brands and sizes of needles that work on your particular sewing machine. WHILE GREAT GRANDMA APPRECIATES THAT YOU ARE DETERMINED TO USE UP ALL THE THREAD IN THAT DECORATIVE TIN THAT SHE BEQUEATHED YOU, IT'S BETTER NOT TO USE IT FOR PIECING A QUILT- I KNOW IT'S ON THOSE COOL WOODEN SPOOLS TOO- BUT UNLESS IT'S AN ALL COTTON 40 OR 50 WEIGHT QUALITY THREAD IT'S BETTER TO KEEP IT IN THAT TIN AS A SENTIMENTAL MEMORY OF YOUR BELOVED QUILTING ANCESTOR. 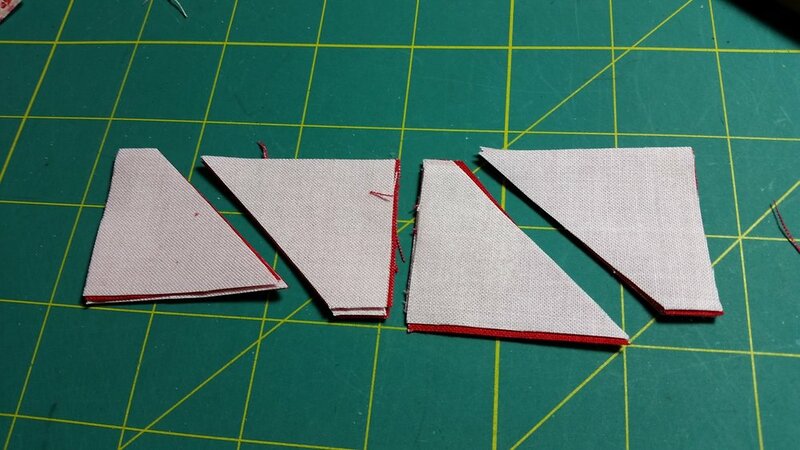 GET YOURSELF SOME GOOD QUALITY PIECING THREAD AND WATCH HOW MUCH BETTER YOUR PIECING LOOKS WHEN YOU USE IT. I LIKE AURIFIL THREAD. OH OKAY - I LOVE AURIFIL THREAD! USE WHAT YOU LOVE: This is my CLEARLY PERFECT ANGLES A 'window' cling style guide that clings to the bed of my machine and helps sew perfect diagonal lines and 1/4" seams. I don't ever have to draw lines on my squares. YAY! I love this tool. MOST USEFUL TOOL IN MY TOOL BOX : The lowly seam ripper, or as my quilting buddy Mary calls it. "my UN-sewer". On it's own a useful & necessary tool but it's real impact is based on your willingness to use it. 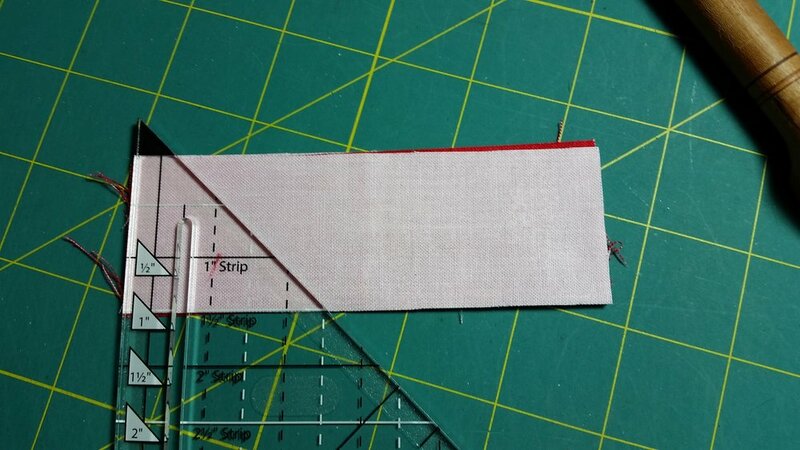 If you have to ask yourself, "should I redo this seam?" you probably need to redo that seam. Get out your UN-sewer and have at it.